Fill out our simple form and get quotes from local fire eaters. For a dynamic and ambient performance choose a fire eater or fire breather to perform stunning tricks to thrill your guests. Open or close your celebration with a real wow factor. Does your event need heating up? Our fire performers are the perfect and exciting addition to any event. Our fully insured fire show includes fire spinning, eating, juggling, and body burning leading to a finale of fire breathing. Our family friendly show is sure to leave you feeling hot, hot, hot. Experienced and Talented Fire Performer based in Bristol with Family Friendly Comedy Fire Show. Great for weddings, parties and significant Birthdays. We can provide a fire eater for wedding entertainment - juggling, fire eating and balance stunts. Our fire artists perform at weddings, corporate events, parties and product launches giving you that show stopping entertainment. Fire performances can be set up indoors or out and offer a range of options from fire juggling to fire eating. Fire performers are professionals and well trained in their art so that they can produce the most stunning show safely and spectacularly. Great for launch events, or as a meet and greet arrival entertainment for corporate events where the aim is to impress. Choreographed stage shows or smaller, close up fire performances are both options for any event. 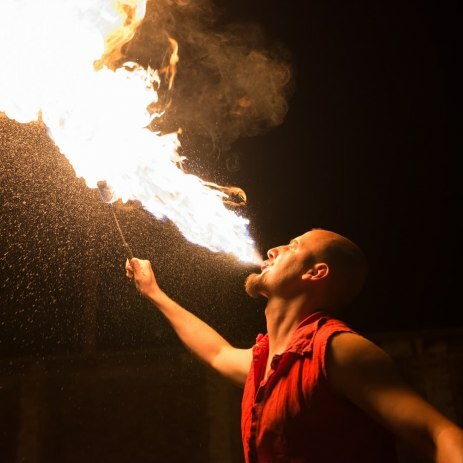 To find fire eaters and fire breathers who can perform at your event, simply complete a free quote request form online here.